Brick is a patient and unobtrusive material that lends itself to a variety of uses and tends to outlast the periodic styles in which it becomes incorporated. It is characterised by a basic dignity, no doubt borne of its millennia-long existence and re-invention in architecture within an array of cultures worldwide. This book MASONRY. Material and Structure is an anthology of brick and the many applications of masonry in practice today presents a detailed, case-by-case analysis of the material and structure, its role in contemporary architecture and its evolution from traditional patterns to modern, flexible bonds that highlight the structure and texture of buildings. This book MASONRY. 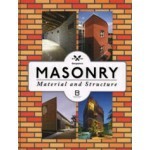 Material and Structure is an anthology of brick and the many applications of masonry in practice today presents a detailed, case-by-case analysis of the material and structure, its role in contemporary architecture and its evolution from traditional patterns to modern, flexible bonds that highlight the structure and texture of buildings. More than 30 projects are presented in texts, technical drawings and photos.